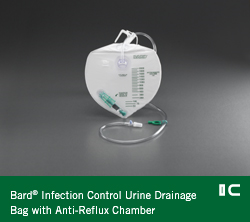 Bard’s Urine Drainage bags feature a rounded, teardrop shape that ensures more efficient drainage. Their drainage bags are available in a wide range of sizes including larger capacities. Bard® Dispoz-a-Bag® Leg Bags are made from heavy duty vinyl for extended wear, odor containment and leak resistance. Each leg bag contains an anti-reflux valve. Available with or without the Flip-Flo™ drainage valve which opens and closes with a simple flip. Reusable, sterile.